With the 2012 Geneva Auto Show press days now over it’s now time for the masses of enthusiasts, families and other spectators to crowd the floor of the convention center. As with all autoshows, Geneva 2012 had its share of crazy concept vehicles and every type of transportation. From the stunning 760-horsepower Ferrari F12 Berlinetta to the eye-catching and outrageous all-electric Tata Megapixel the show has all the bases covered. Along with hundreds of vehicles, Geneva 2012 exposed new trends within the industry. One of the overriding examples of this was the number of sport compacts. Three German manufacturers; Audi, BMW and Mercedes-Benz all had their own creations, ranging from Mercedes’ five-door and family-orientated A-Class, to the three-door Audi A3 and BMW M135i. Mercedes’ A-Class was by far the most economical of sport compact shown, and with 5-doors it’s also the most practical. Two engine variants power the new A-Class, both of which are turbocharged. The smaller 1.6-liter produces either 115 HP in the A120 or 156 HP in the A200. The top A-Class, the A250 gets a larger 2.0-liter four-cylinder, bumping the peak output to 211. Putting the power to the ground come via a six-speed manual transmission, or an optional seven-speed dual clutch automatic transmission. Numerous features and stylistic and design cues round out the A250. On the exterior 18-inch AMG alloy wheels and brake calipers finished in red. On the under side, an AMG-derived front axle and suspension, which should give the relatively small A-Class excellent road handling. 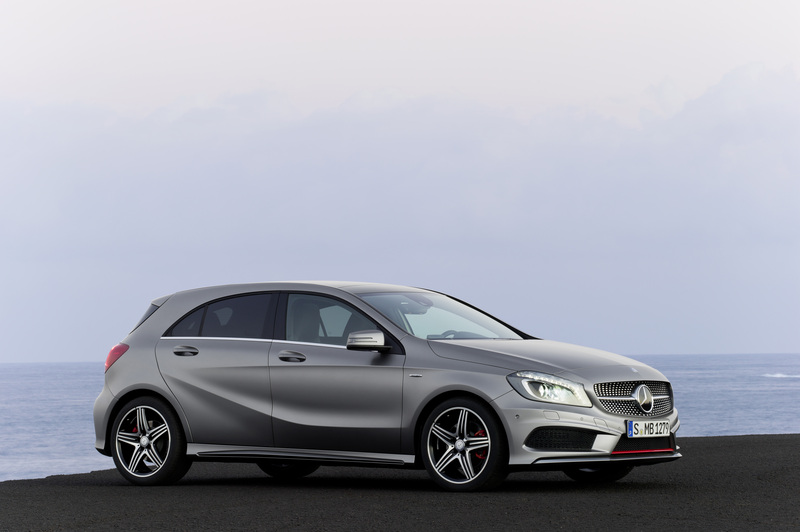 The A-Class is scheduled to arrive in European showroom later this year, while the U.S. market will likely have to wait until 2013. 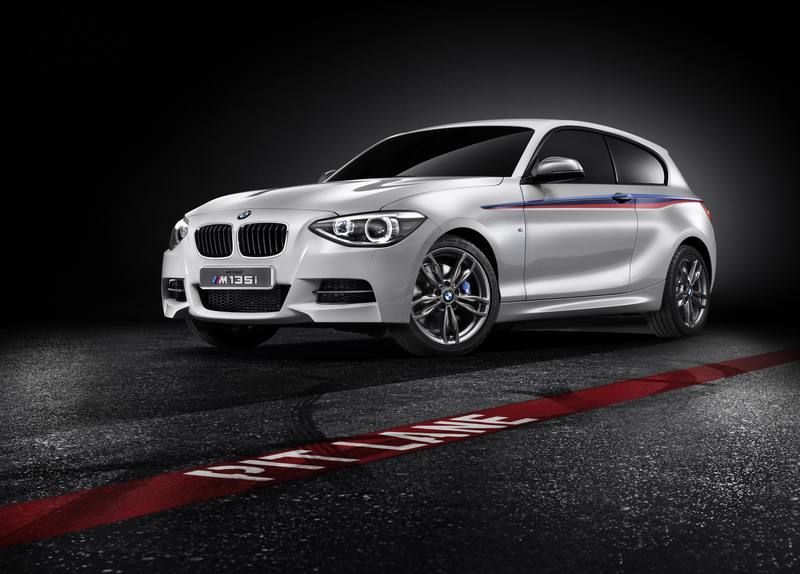 On the complete opposite end of the sport compact spectrum is the BMW M135i. As the “M” in M135i might imply, BMW Motorsport has done extensive work throughout this hot hatchback. On the outside the new BMW M Performance three-door resembles its older cousin the BMW M Coupe, produced between 1998 and 2002 and fondly nicknamed “The Shoe” by enthusiasts for its unique profile. Like the M Coupe the new M135i is powered by a inline six-cylinder engine, but that’s where the similarities end. Unlike the naturally-aspirated 3.2-liter in the M Coupe a smaller displacement 3.0-liter turbocharged unit propels the M135i (the same one found in the two-door 1M Coupe.) Engine size might have decreased, but peak horsepower is up, to 300 in the M135i. This beats the shoe’s by 60-horsepower, and beats out the more fuel friendly A250 by 89-horsepower. Similar to the A250, the M135i rides on 18-inch alloy wheels and has extensive suspension modifications when compared to a regular 1-series. Falling in between the Mercedes A-Class and the BMW M135i is the new Audi A3. It’s been over 10 years since the A3 has been redesigned, so its unveiling has been long anticipated. With eight different engine options available for the European market there’s something for everyone. From the miniscule displacement of 1.2-liter TFSI, to the 1.6-liter TDI with just-horsepower, one might not get going quickly, but you’ll surely get great fuel economy (Up to an estimated 60 mpg with in 1.6-liter TDI). All of these different engines are paired with an equally larger number of available transmissions. While many are connected via a traditional six-speed manual, customers can choose the S-Tronic duel-clutch gearbox with either six or seven speeds (depending on engine). With a mix of sporty and agile handling, practical, everyday usability and in the case of M135i, world class performance it’s not surprising the sport compact market is expanding and becoming more competitive. Whether its the economical five-door, four passenger Mercedes A-Class or the enthusiast and speed-junky approved BMW M135i the likelihood of these types of vehicles will become more popular as manufacturers create more models and variations.